Home » Copycat Restaurant Recipes » JJ’s Boulangerie Pan Bagnat Sandwich – In Las Vegas, you can get a taste of Paris, at the Paris hotel. JJ’s Boulangerie Pan Bagnat Sandwich – In Las Vegas, you can get a taste of Paris, at the Paris hotel. JJ’s Boulangerie is located in the Paris in Las Vegas. Here is their recipe for one of their most popular sandwiches. 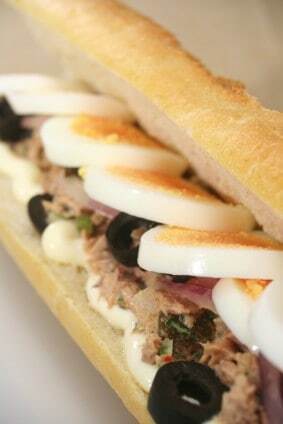 JJ’s Boulangerie at Paris Hotel is Vegas is known for this amazing sandwich, you can make it at home. Sandwich Slice bread in half and soak each side with vinaigrette. Then build sandwich by layering lettuce, sliced peppers, sliced onion, sliced tomatoes, 2 basil leaves, sliced egg, olives, and then tuna. Then season again with a little more salt and pepper and place top piece of bread on sandwich. Cut in half and serve. Vinaigrette Combine the first 4 ingredients and then whisk in oil. Chill before using. I made this the other day for lunch it was so good! I love tuna but this sandwich is not like your garden variety tuna salad sandwich.